If I disable WindowBlinds, Visual Studio starts fine. I've excluded devenv.exe - "Ignore this application and don't skin it". After re-activating WindowsBlinds and rebooting - VS still crashes on launch. Just discovered - it crashes with some styles and doesn't with the others. Just switched from Diamond, which I used for the last year, to Diamond (Windows 8) and Visual Studio stopped crashing (devenv.exe is still excluded). Another piece of discovery: Visual Studio started crashing on launch again. So I switched back to Diamond style and crashing stopped. So the conclusion - right after switching between styles Visual Studio doesn't crash but after some time passes it starts crashing. Based on the information we have we believe this to be a bug in the Microsoft product with handling system wide fonts. Microsoft would need to resolve the issue. For now you could avoid the issue by using themes which do not set system wide fonts, or using the feature built into WB to disable the use of system wide fonts on a theme. This can be done by clicking Modify style and then on Fonts and then clicking Do not apply any style system wide fonts. wow, Im glad I found this thread. and decided to use windowblinds again and ran into the same problem. for some reason the setting doesnt take effect when booting into the system. I have to hit apply skin and then start visual studio. if I dont then it crashes. but then visual studio crashes again the next time I boot the system. I can confirm quoted post. Until resolved I decided to not use WindowBlinds. I guess it does not effect everybody. It open up ok on my Glassmaxx10 running on Windows 10 and Windows 7. I applied "Do not apply any style system wide fonts" and VS still crashes on start. It didn't do it right after I did the update but after a while started doing it again. After you boot the PC, log in your user account and set a style "for first time" in your current user session, and then try to run visual studio, it will crash. But If you ran Visual Studio before setting any style in your current user session, then you can set any style and any current Visual Studio instance will not crash, and if you close Visual Studio, the next time you run it (in the current user session) it will NOT crash, regardless of the active theme. For those reasons for me it seems a WindowBlinds bug more than a theme issue.. Checked that and can cofirm it is true for me too. Come on Stardock, you should attend this annonying issue that affects programmer users. Solve this bug in some way... soon. thanks. Thank you for your feedback. With your help we have determined that this issue belongs to Stardock Software's WindowBlinds. Please go to https://www.stardock.com/support/ to report the issue. COME ON STARDOCK DEVELOPERS, MONTHS AGO SINCE HALF OF THE LAST YEAR EVERYBODY HAVING THIS BUG AND YOU STILL NO UPDATING AND NO FIXING ANYTHING, DO SOMETHING FOR THE USER, WE ARE PAYING FOR YOUR PRODUCTS, DON'T FORGET THAT, WE DON'T WANT TO BUY AND/OR USE A BUGGY PRODUCT. I initially got feedback about this issue and then all my requests have not been answered. I face this too for some months now. I appreciate that the company might be a one man team and if he is poorly .... who knows. We are all only human. But yes, I woudl liek a fix because it is annoying to constantly unload WB just to use VS.
it is annoying to constantly unload WB just to use VS.
@Stardock: where are you when we (the customers, the users, the voice) need global support to give us a solution/fix/patch/update for a problem that is caused by one of your products?. If Stardock's dev. team has no progress on this issue or has no future plans to debug and try fix it, then it is better than nothing to say us that instead of still ignoring us. No matter if bad news or good news, but we need TRANSPARENCY to feel comfort as customers. We are aware of this issue and are looking into it. Thank you for reporting. As everyone can see, they speak, promise, and say things like: "We are aware of this issue and are looking into it", but at the end Stardock do nothing after more than eight months suffering this issue... probably they are still "looking into it"... sure they will use more similar empty words like that to excuse their incompetence or just because any excuse is better than saying: "we don't care about this problem" to avoid damaging their commercial image. How to fight this?, just uninstall the product since it is bugged and the company will do nothing to fix it because probablly we are a minority of programming users. I just will stop suggesting other potential customers to buy and confide to Sardock. Microsoft Windows 10 1709.16299.15 (x64) a.k.a 'Fall Creators Update' with public release at October 1, 2017. Microsoft Visual Studio 2017 15.7.2 Professional Edition with public release at May 21, 2018. ...I feel like I am wasting my time writting specs. (again) for a company that does not seem to want to support this problem. It's weekend,people has life to live,not just going online,coming to company forum incessantly complain the issues over and over again. For that do have an issue, reapplying the WB theme will resolve it. Unfortunately whilst we are able to reproduce it now at will, we have yet to be able to track down what it is unhappy about or why it suddenly becomes unhappy when it isn't if you launch VS directly after login. Something triggers it and once that something happens a theme reapply will fix it. BUT if the issue has yet to happen a theme reapply does not stop it happening later. Clearly something triggers this and as yet we are unable to see what that thing is. We can assure you we are still looking into it. But I gave you the feedback from Microsoft. They develop the IDE so you need to talk to them. You need to work together. I am sure they will assist you. Stopped using Windows Blinds a while ago due to this issue. 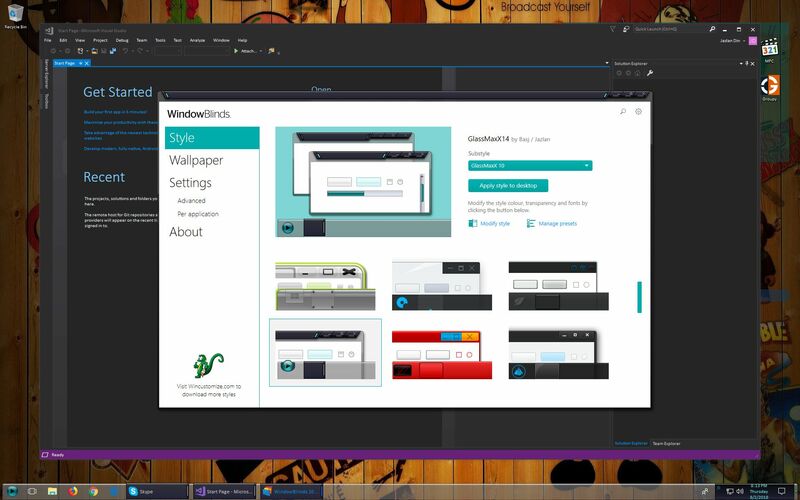 Getting used to Windows 10 theme. Ugly but doesn't crash.